Earlier today, The CW hosted a Q&A press conference with actor Grant Gustin, who will be playing Barry Allen/The Flash on Arrow and a hopeful Arrow spin-off that will have a pilot shot in a few months. Joining him in the Q&A were Arrow Executive Producers Greg Berlanti and Andrew Kreisberg as well as DC Chief Creative Officer Geoff Johns. All three men were involved with the writing of the two Arrow episodes to feature Gustin as Barry Allen; the first of those episodes, “The Scientist,” airs this Wednesday, December 4 on The CW. Fans of Glee might recall Grant Gustin as playing the dastardly slushie-throwing Warbler Sebastian — and immediately, it is obvious that Barry Allen is a much nicer fellow. “I immediately thought he was really funny and endearing, and I hadn’t done anything like that,” Gustin says about his impression of the Barry Allen role. “I had a lot of fun with that, just throughout the audition process; they kind of started steering me in that direction immediately. They said to just have fun with it, and I kind of took it from there,” he says. 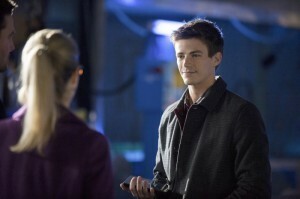 Barry heads to Starling City to investigate a strange matter that is going on in town. Once there, he immediately sparks a kinship with Emily Bett Rickards’ Felicity Smoak. The Barry-Felicity interaction might have an effect on how she and Oliver relate going forward. “Especially with the way the season has been going, with Oliver and Felicity and their growing relationship or feelings for each other, the fact that Barry and Felicity are so similar, and they’re both sort of uncomfortable in their own skins, and they’re both very likable and personable, they just seem like they would instantly hit it off, which would just complicate things for Oliver even more. It felt like the right way to go,” Andrew Kreisberg explains. Gustin’s Arrow episodes will lead into a hopeful Flash series, with a pilot episode being directed by David Nutter in early 2014. Kreisberg, Berlanti, and Johns are all involved on the creative side. Kreisberg feels that Barry is a character that the audience can get behind. 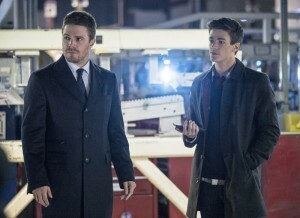 See some images from the Arrow episode “The Scientist” here – don’t miss it at 8PM Wednesday, December 4 on The CW!